The TAFN MEGA-SERIES delivers the highest power of almost all amplifiers on the market and are designed to run continually and reliably. It also has a soft limiter for high frequencies and a hard limiter for low frequencies, already built in. The limiter can be set at lower RMS power levels to handle lower-power speakers, without sacrificing the high headroom of the amplifier. 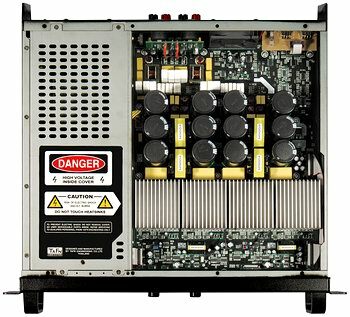 The mega 9002, specially designed for two ohms load, delivers the highest power of any amplifier in the market loaded at 2 ohms running continuously. The mega 9004 is designed for four ohms load, but has much higher headroom or power per speaker. It can also run continuously and reliably. The MEGA series delivers quality, safety features and an unmatched price to power ratio. Rarely can an amplifier offer such a rock-solid, reliable and powerful sound, in a unit custom-designed to keep performing continuously. 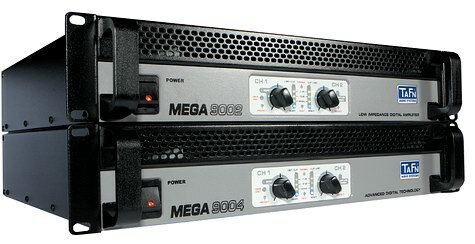 MEGA SERIES gives customers a choice between two high-power amplifiers, the MEGA 9002 to take a heavy load, driving four speakers per channel (2ohm), while the MEGA 9004 drives two speakers per channel (4ohm) but with much higher headroom or power per speaker. The mega 9002 is designed to take extremely high current. It can drive four speakers per channel (2 ohm) at very high power, with a peak current of 80 amps while keeping high headroom. No other amp in the market can match that capability and run continuously. It will deliver without clipping 4600 watts rms per channel, or 1150 watts per speaker. In the bass, when hard-clipping, it will deliver up to 5,800 watt/channel (or 1400 watt/speaker). The mega 9004 is designed for two speakers a channel (4 ohm), but on the other hand has much higher headroom or power per speaker. It delivers without clipping 4,000 w/channel, or 2,000 w/speaker; and in the bass when hard-clipping, 5,500 w/channel, or 2,750 w/speaker. The MEGA series special circuitry gives the amplifier more control over the movement of the speaker cone, yielding a realistic, rock-solid sound. Our power amplifiers clamp the speaker cone electrically at all times during the wave cycle giving the best possible control of the speaker, so the sound is as realistic as it can be.See more. The limiter has a variable threshold depending on the frequency, which gives users what they want. It imposes a soft limit in mid-high range, a hard limit in bass range which gives plenty of punch ,and there is a smooth transition in the low-mid frequencies. The MEGA SERIES imposes a soft limiter on frequencies higher than 300hz (mid-high), and a hard limiter for frequencies lower than 90hz (bass) to deliver an extra boost of about 30% after clipping which is adequate to get the maximum punch without any audible distortion. Between 90hz and 300hz, which is the low-mid frequency range, there is a gradual change from hard-clipping to soft (non-clipping). However, when the limiter is set to the low power, the bass will be just at the clipping level, and the mid-high will be at 40 per cent less power. In that case it would deliver a soft limit over the full band but still with a different threshold between mid-high and bass range. Because mega series can deliver so much power, we have built a low power limiter designed to lower the power for many situations where the speakers cannot handle so much power while still maintaining the full headroom of the amplifier. The low-power limiter reduces the RMS power while the power supply remains at full D.C.voltage to keep high headroom in place. In other words, it limits average power to the speaker, but not the peak power, ensuring better protection for lower-power speakers, while still delivering high power peaks. The sound is as clear and dynamic as it can be. The short delay in the response time of the limiter allows high peaks, ensuring the sound remains clear and delivers the full headroom of the amplifier while the maximum average power is at 60 %. Because the threshold of the low-power limiter is much lower than the dynamic range of the amplifier, there is plenty of room between that threshold and the maximal dynamic range of the amplifier, allowing for high peaks in relation to the power that are unlikely to clip. This produces a very clean and clear sound which in mid-high levels is desirable. When the Low Power Limiter is ON the gain of the amplifier will be reduced according to the power to maintain the input sensitivity at 0.775 V RMS. The MEGA series contains a full range of protection features to prevent high-frequency oscillation, short-circuiting, current overloads, sudden power surges, DC leakage to the speaker, and overheating. We safeguard against every possible risk, and even offer a soft turn-on feature which avoids any surge in current when you turn on the amp, allowing many amps to be turned on at once. For more information about our protection technology, see here. In the event the amplifier reaches 80 deg C, the amplifier will shut down. However, before reaching that point, at 70 deg C, the power will drop slightly, giving the amplifier a chance to cool; once it has cooled, the power will restore to previous levels, which makes it unlikely the amplifier will ever reach 80 deg C, ensuring performance is never interrupted.